Especially in the winter, one of the things I like to keep on hand is Chicken Stock. When made properly, it has a delicate flavor that is not only a great base for soups, but adds flavor to rice or risotto, and is delicious for poaching vegetables too. By using quality ingredients, the chicken stock you make will be far superior than store bought, and won’t contain tons of sodium. If you buy whole chickens and butcher them yourself, you will get even more bang for your buck. A common misconception is that you simply dump chicken scraps and vegetable scraps into a pot, fill it with water, and boil the hell out of it. The tendency is also to put in way too much water and too many vegetables. 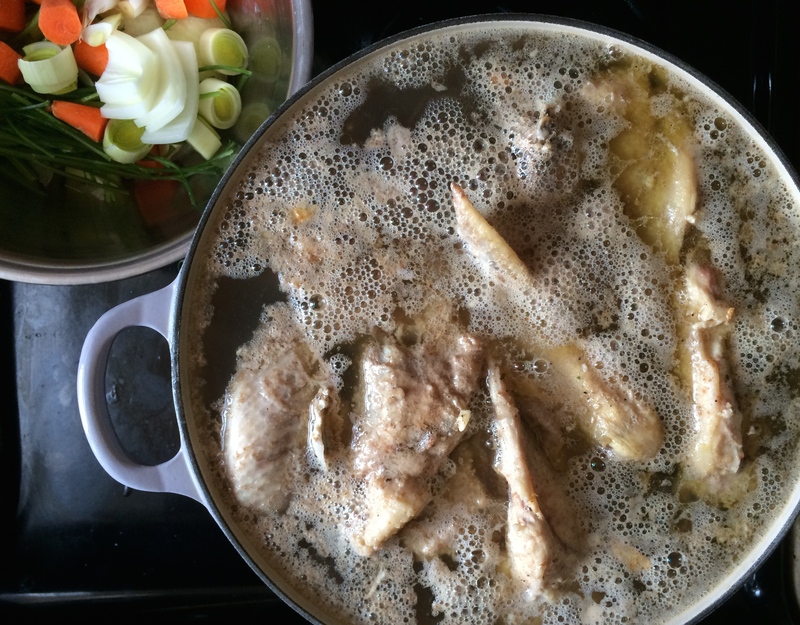 The result is usually a cloudy vegetable stock with little chicken flavor instead of a clear, flavorful chicken stock. The key to flavorful chicken stock is in the proportion of chicken bones to vegetables, or aromatics. The aromatics should comprise only 15-20% of total weight of bones. That’s a 5:1 ratio of bones to vegetables, maximum. The French use a combination of onions, carrots, and celery, known as mirepoix, sometimes with the addition of some leek whites. In Chinese and Asian cooking, the aromatics are often comprised of ginger, garlic, and scallions. Whatever you use, keep your aromatics simple. Don’t use vegetables that will break down and cloud your stock, such as potatoes. Also stay away from aggressive flavors such as asparagus, cabbage, etc. and dark green vegetables that will leach out and discolor the stock. Use only enough water as needed. Use a tall stockpot to minimize evaporation, and add only enough water to cover the bones by about 1 to 2 inches. If the liquid gets low, you can replenish by adding a little hot water to just keep the bones covered. Never cover the stockpot. Skim, skim, skim. As the stock simmers, the bones will release impurities and fat that rise to the top, which you must remove. As the fat comes in contact with the air, it will congeal slightly, making it easier to skim. Most of the crud will be released in the first hour and should be removed before you add your aromatics. Then a periodic check for fat and foam should suffice. Let that baby simmer. Whatever you do, don’t stir things up and don’t let your stock boil. Both of these will cause it to be cloudy. 1 small yellow or white onion, approximately 5 oz. 1 medium carrot, approximately 4 oz. 1 stalk of celery, approximately 1 oz. a few parsley stems, if available. 1. Place the chicken bones in a tall 8 quart stock pot. Cover with about 1 to 2 inches of cold water and bring to a boil. Lower the heat and simmer for one hour, periodically skimming any foam and fat that rises to the top. 2. Meanwhile prepare the remaining ingredients. Peel and chop the onions and carrots into 1″ – 1-1/2″ chunks. Cut the celery the same size. 3. After the first hour, the bones will have released most of their impurities. At this point, add the rest of the ingredients and simmer for another 2-1/2 to 3 hours. Fat, and some remaining impurities will continue to rise to the top of the liquid, and should be skimmed from time to time. It is helpful to keep hot water on hand to replenish the liquid as needed to keep the bones submerged. 4. After 2-1/2 to 3 hours of simmering and skimming, the stock should be ready. You will notice that it has become quite clear, and you should be able to see the ingredients that have settled to the bottom through the liquid. Taste your stock. It should be flavorful, and taste of chicken, not vegetables. 5. Strain your stock through a fine mesh sieve or a colander lined with cheesecloth. Discard the vegetables. The bones can be saved and used a second time to make a Remouillage*. 6. If you are not using it right away, it is important that you cool your stock quickly so that you can get it into the refrigerator or freezer. I usually divide the stock into quart size containers and sit them in a baking dish or roasting pan filled with ice water. When they have cooled to room temperature, cover and label the containers and refrigerate or freeze. If you will be freezing your stock, make sure to allow an inch of airspace in your container for expansion. *Remouillage – This refers to both the process and the secondary stock obtained by simmering stock bones a second time, in order to extract the remaining gelatin. The remouillage will not have the flavor of a primary stock, but can be used as a base for new stock, or reduced to concentrate the gelatin, and used to add body to soups or sauces. Hi there, what quantity of stock would you say you get from this recipe please? Kimberley, the recipe should make about 3 quarts. Thank you so much for this! I have been making chicken soup all winter, trying different things. Interestingly, the recipe I went with is exactly what you published. The only thing I wasnt sure about was the ratio of water to chicken and how much chicken and what size pot. Most recipes I found were confusing or not very helpful or the ratios were off. I have been using chicken necks – I can get 3 lbs for less than $3. If I want to add bits of chicken after, do you suggest that I roast chicken legs/thighs in the oven and add the meat at the end for soup? Also, should I add fresh vegetables or use the ones that were originally used for the stock? one more question — no salt? At one point is it okay for me to add salt for chicken noodle vegetable soup? Maria, to make this stock, I use an 8-quart stockpot. I put the bones in the pot first, then just put enough water in to cover them by about one or two inches. It usually ends up being about 3 to 4 quarts of water. Store-bought stock is usually packed with sodium. One of the reasons I like to make my own is to have more control over how much salt ends up in whatever I’m using it to cook. So no, I don’t salt my stock. As for soup, I never use the meat or vegetables from the stock. After simmering for 2 hours all their flavor has leached out into the liquid anyway. For soup, I suggest you start with fresh vegetables and herbs. Saute them in a little cooking oil, then add the chicken stock – how much depends totally on how chunky or brothy you like your soup to be. If you choose to use already roasted chicken, then simmer the vegetables for about 15 minutes and add the chicken at the end just to heat it through. As for salting your soup, I it’s good to get into the habit of seasoning and tasting at each stage of cooking. For example, I would add a little salt while sauteeing the vegetables, taste them to make sure they taste good, then add the stock, bring it up to a boil, then add a little more salt, then taste again. Finally, after adding the chicken pieces, I would taste the soup again, then adjust the seasoning to your taste. I scoured the web for a superb chicken stock. Some looked ok while others seemed too simple. I like simple but creating a flavorful chicken, or any other stock is like preparing a demi glace. It takes TIME, patience, and quality ingredients. That’s what I found in your recipe. Followed it to a ‘T’ and wound up with a stock that is profoundly delicious! Your whole recipe process seemed logical to me and that is why I chose it. Outstanding job and thank you! Wow, that’s great. I always keep a bunch of it in my freezer. It makes such a difference, especially in something like risotto. Really glad the recipe gave you good results too!